Ukraine has been using Russian software for secrete talks. President Petro Poroshenko and NSDC Secretary Oleksandr Turchynov Thursday familiarized themselves with the new system of protected video communication, developed by the state service of special communication and information protection, presidential press office reported on 21 July. 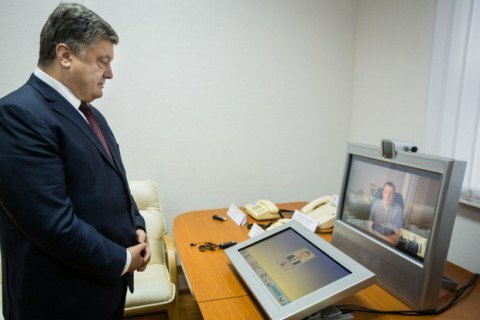 Poroshenko tested the new system to call the chairman of the Chernihiv Regional State Administration Valeriy Kulych. Head of State and the Secretary of the National Security Council were demonstrated offsite communications centers and government communication stations. "In late 2013 - early 2014 the situation was horrible. The software that we used was 100 percent Russian-made. The aggressor country had fell access to our state secrets, so we had to develop own system from scratch, both hardware and software system for protecting our information. He had to radically refurbish and restart or systems of confidential communications," Poroshenko said. In May 2015, the Cabinet of Ministers approved the action plan for the creation of the National Network of mobile communication of government agencies.